I’ve been told you should never apologise for blogging absences or poor photos so I won’t do either. I have been cooking but lots of testers and repeats, and my love hate relationship with my camera is rapidly turning into a hate hate one. Anyway, I decided to join in with the PPK Spring Cookbook Challenge to spur me on to use some neglected cookbooks and to give me an incentive to get back into blogging. The aim is to try and cook 6 dishes from each book, which were chosen by a highly elaborate voting system. 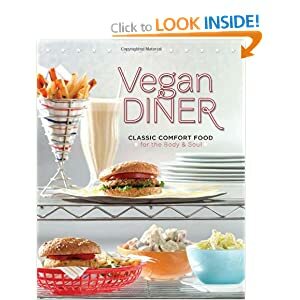 I jumped in a few weeks into the challenge with Vegan Diner by Julie Hasson. I’ve had the book since it came out and like many of my books, I had an initial flurry of cooking with it but it’s been sitting on my shelves ever since. 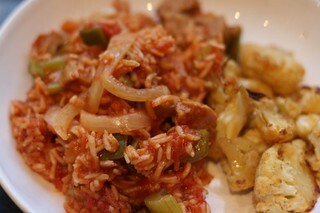 I started the challenge with the jambalaya, which I’ve had pencilled in for a long time. 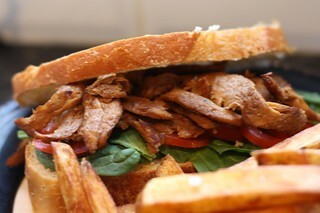 It was very easy to make and made loads, so it’d be great for a crowd or when you need leftovers. 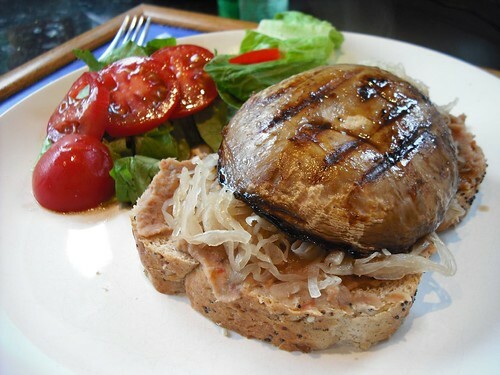 We ate it for lunch for a good few days, and it stayed tasty. 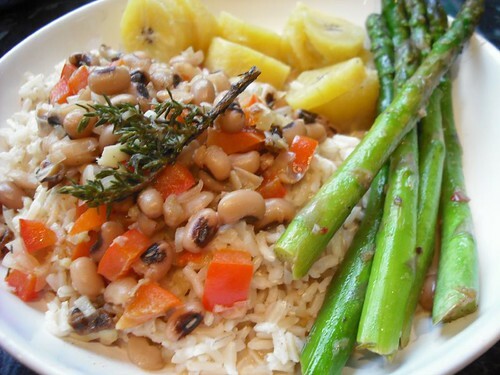 I used the top amount of Creole seasoning and it gave it a good level of heat. It was so easy that I had time to whip up a side of spiced roast cauliflower to serve alongside it. 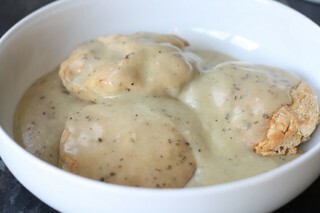 Next up – biscuits and gravy. I used to make them quite a lot using various recipes, mostly from Vegan Brunch. They aren’t eaten in this country at all, so I’d forgotten about them until my recent trip to Chicago, where we ate a superb version. I really don’t know why we haven’t embraced them as a nation as they’re an excellent breakfast. I tried hard not to overwork the dough for the biscuits but I think I must have because they didn’t rise much and were a bit dense and tough. The gravy though was superb, lovely and savoury and rich and I’ll certainly make it again. Others with a lighter hand then mine may enjoy the biscuits but I’ll try another recipe next time. 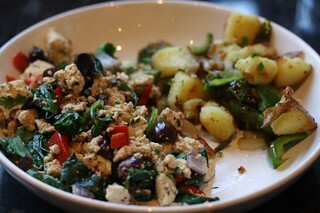 The next recipes I chose for the challenge were the Greek tofu scramble with the breakfast potatoes. I had them in the evening but they wouldn’t be too difficult to knock up on a bleary eyed morning. Neither recipe is anything revolutionary but they worked together very well. I find it hard to dislike tofu scramble in any form and this one is very tasty – I especially liked the kalamatas and spinach in it. The potatoes were crispy with tasty bits of browned potatoes and garlic. Finally I made the smoky soy curls. 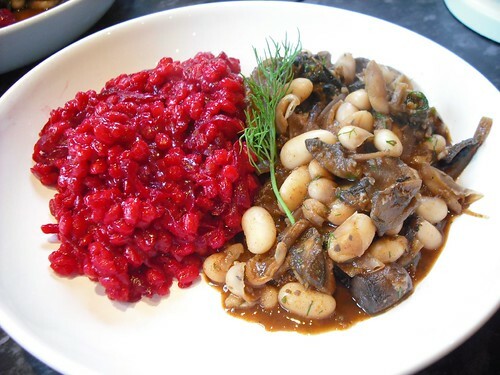 I’ve used soy curls a few times before and never found them especially thrilling but this recipe gets so many rave reviews that I decided to have a go at it. My favourite way to eat almost anything is in a sandwich so I threw them in between 2 slices of lightly toasted bread with mayo, spinach and tomato. 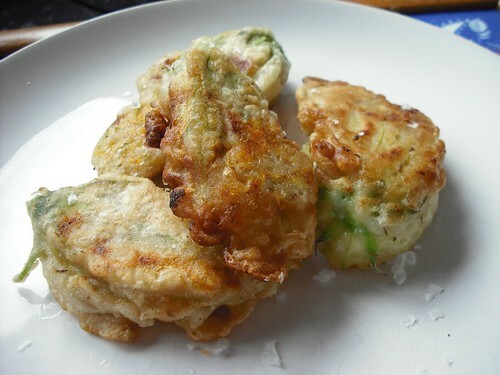 They were very easy to prepare and I liked the texture a lot but I could definitely taste the soy through the flavourings and it wasn’t very pleasant. These weren’t bad but I wouldn’t make them again. I think that’s more about my dislike of soy curls than the recipe though as everyone else seems to love them. Incidentally, you can just about see why my husband complains so much about my bread slicing technique! So that’s 6 new recipes tried for this challenge with generally good results. Previous recipes I’ve tried are: chilli, smoky mountain cheese and garlic dill bread, sloppy Joes, onion rings, horseradish potato salad and smoky potato scramble. I still want to try some of the seitans, especially the pastrami style. I like this book, nothing I’ve made is earth shattering but it’s very reliable, the recipes aren’t complicated and the results are good. 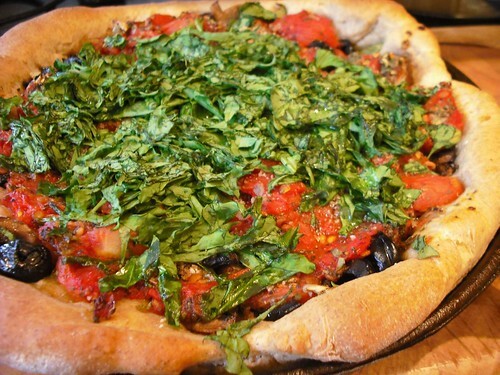 I’m definitely looking forward to Julie’s pizza book when it’s released too. Next the cookbook challenge moves on to Chloe Coscarelli’s two books. Unsurprisingly I don’t have the dessert one but I’ll be picking out some more savoury recipes from the first book, and hopefully blogging about them! I get asked a lot of questions about how I got into recipe testing and what it involves, so I thought I’d do a post about it and my experiences testing. Then I really hit lucky when Isa asked for testers for her new book Vegan Brunch. I was honoured to be chosen, and loved doing all that testing. After that Joni asked if I’d help out with another project with Celine, for a mammoth project, 500 Vegan Recipes. That testing whizzed by; those girls had a really tight deadline and cranked out recipes so quickly that I didn’t test as much I’d have liked. Then came Terry’s Vegan Latina, then Tami’s Vegan American Kitchen, and now Isa’s new Healthy Vegan book. So I’m a busy tester right now! It’s months since I’ve eaten an evening meal which wasn’t a tester. 1. So how do you actually do it? The authors have a website, usually a discussion forum but sometimes a blog, that’s password protected for testers. They post a recipe and we go away and work at it. Then we give feedback about how long it took, whether we liked it, how many people it served, how we’d change it etc. Then the recipe either gets tweaked, changed, or after a certain amount of tests, gets closed for testing. 2. Do you get paid? Ha! No. I get a copy of the book. 3. So why on earth do you do it? Well, I love cooking, but I don’t really have much inspiration to create my own recipes. I love the idea of feeding into a project. I hate books with mistakes, or when its obvious that the recipes haven’t been tested properly. And I love making friends with the authors and other testers too. I’ve done some great food parcel swaps so that we can all have access to the ingredients we need. And it means we eat something different every single night! Well, anyone in theory could, but here’s a list of things I think you need to bear in mind if offering or planning to test recipes. Flexibility. Recipes sometimes appear in a big rush all at once, and sometimes not for a while. You might need to change your meal plans at the last minute. Cost. It isn’t cheap! You might sometimes need just a spoonful of an ingredient you don’t normally buy, or go to a few different shops to track something down. You’ve got to be cunning with leftovers too or you start to waste stuff. Feedback. You need to be clear in your own mind about the difference between you not liking something and it not actually working. This is really important. Not everyone can love everything and you need to learn to say so, but when to know it’s probably just your tastebuds. Precision. Your oven temperature needs to be right, you need to weigh and measure things properly, you can’t just throw in a load of extra things like you normally might. And you need to think very carefully about making substitutions and how it affects the test. All the authors I’ve tested for are American, so I’ve learnt a lot about different names for UK ingredients! 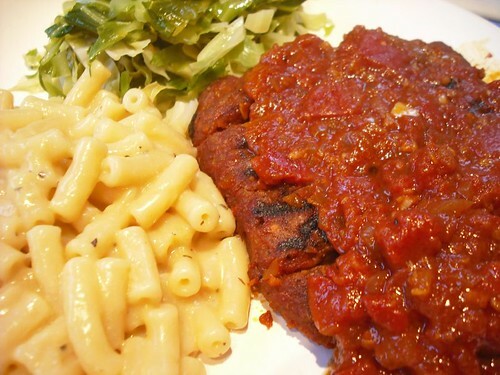 And something which is really difficult for me to get, is very easy for them (say, tempeh, or liquid smoke). Techniques. If I’m just following a recipe from a book I just do it from the instructions. But I’ve noticed that the most common mistake authors make is listing an ingredient then not referring to it, or vice versa. So now I get all the ingredients on the counter first so that I can easily notice if something isn’t used. Chance of failure. Of course if you are testing a recipe, there’s probably more chance of it not working than if you pick one from a book. I made Isa’s omelette from Vegan Brunch at least 4 times before I got it to work, so I had a few meals of broken up omelette type stuff. But you take the rough with the smooth and its great when it eventually does work! But I love testing, I’ve loved everything I’ve done. It’s made me a better cook, given me access to tonnes of new recipes, has introduced me to loads of great people, made me become a big part of the vegan community and given us lots of new things to eat and discuss at home. I owe a huge thanks to all you authors and co testers who continue to inspire me! Here’s a few pictures of things I have been testing recently.